Opera is Atlanta's #1 Nightclub. 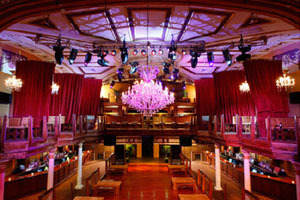 Come experience one of the most beautiful nightclubs in the country. Styled after a historic opera house, Opera features high vaulted ceilings and beautiful chandeliers that provide an atmosphere unmatched. Opera is some to Atlanta's most legendary events featuring athletes, A-list celebrities, and world-ronowned DJs! Only a few South African producers enjoy the success that DJ and Producer Nate Raubenheimer, better known to most as Protoculture, has had over the last 12 years of his career. Hailed by many of his piers as South Africa's biggest dance music export, he has also left his mark on the international dance scene with his trademark blend of melodic and emotionally charged compositions and DJ sets. Sucked into the art of music production at a young age, Nate made the leap to pursue a music career professionally after completing his studies in Audio Engineering at age 20, immediately taking the international psy-trance scene by storm. His international debut came at the United Kingdom's famed Glastonbury Festival. With the release of his first artist album, "Refractions", and the follow up "Circadians", a slew of international performances ensued worldwide, seeing Nate travel to all four corners of the globe. From London to Tokyo, Sao Paulo to Moscow, Protoculture was a staple at psy-trance festivals around the globe, most notably at Glade in the UK, Universo Parallello in Bahia, Brazil, Earthcore Global Carnival in Melbourne, Australia and Ozora Festival near Budapest. Don't miss this opportunity to catch Bengold & Protoculture at this exclusive Atlanta performance! Tickets for this event will sell out! Get yours now! Initial release tickets are available starting at just $15! Bengold & Protoculture Live in Atlanta!